Horizontal axis water turbines are a leading contender for commercial deployment of marine hydrokinetic devices due to their simplicity and their similarities to wind turbines. However, the unsteady loading and its impact on system maintenance, fatigue and life-cycle are not well understood and therefore require high fidelity computational fluid dynamics (CFD). Building high quality structured meshes in Pointwise that are capable of capturing the important physics is a critical enabling technology. Penn State ARL performed a validation study of the device described by Fontaine, et al. (Reference 1) shown in Figure 1. A fifty million cell overset, block structured grid was generated in Pointwise. Overset grid assembly was accomplished with SUGGAR++ from Celeritas Simulation Technology, LLC (http://www.celeritassimtech.com/). 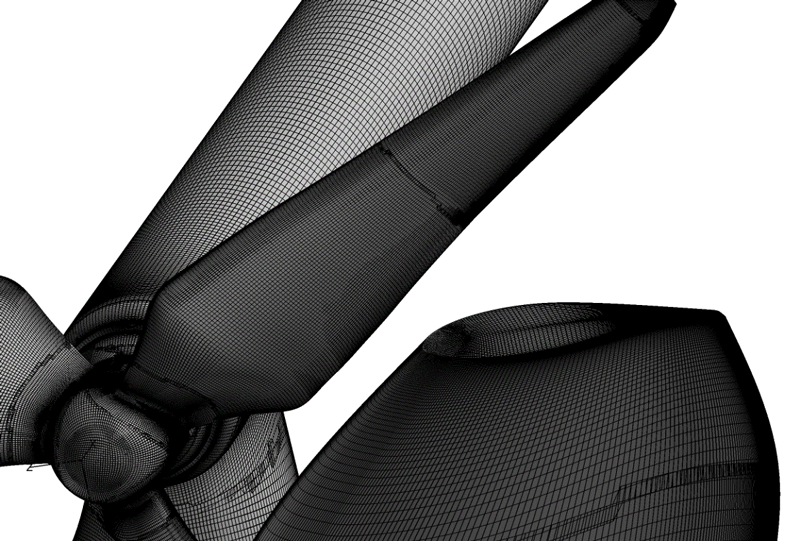 A close up of the blade surface meshes is shown in Figure 2. 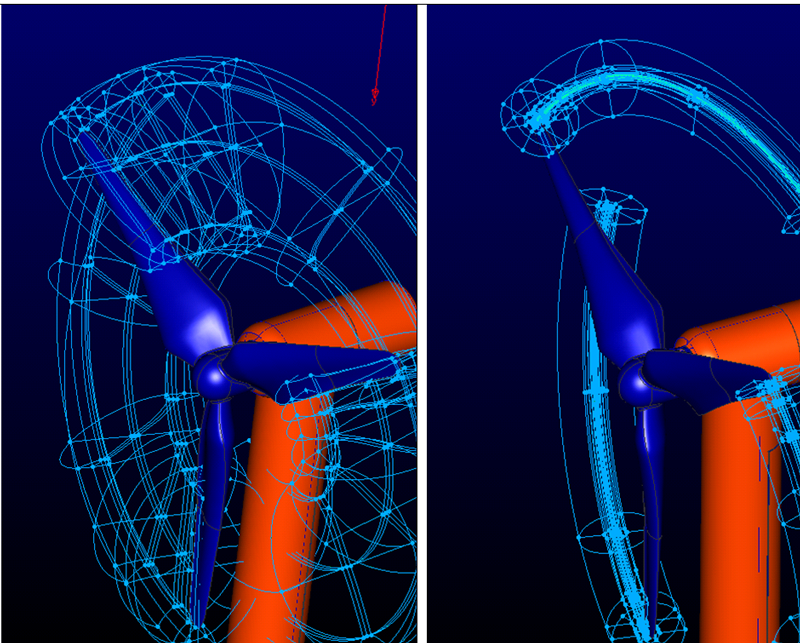 Higher resolution blocks (Figure 3) were added to capture the blade wake and tip vortex, which are essential for accurately predicting the blade to tower interaction shown in Figure 1. Figure 1: Instantaneous flow visualization of the 1:8.7 scale, axial flow water turbine. Overset grid assembly by Suggar++. Figure 2: Overset blade surface meshes generated in Pointwise. Figure 3: Blade wake and tip vortex resolution blocks generated in Pointwise. A comparison of the velocity fields between CFD and experiment is shown in Figure 4. 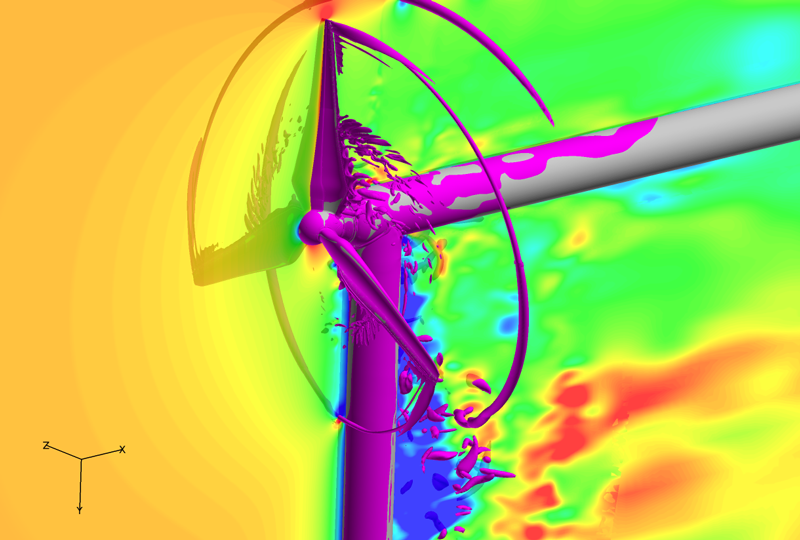 The CFD agrees quite well with the experimental data not only for the main blade potential flow, but also in the blade wake and tip vortex regions, which are critical for predicting the blade-tower interaction. Attaining this agreement requires the use of the overset resolution blocks shown in Figure 3. Building these grids in Pointwise can be accomplished fairly quickly and allows for systematic build-up of CFD grids for assessing flow feature importance. Figure 4: Comparison of the phase averaged tangential velocity behind the rotor. Fontaine, A.A., Straka, W.A., Meyer, R.S. & Jonson, M.L. (2013) A 1:8.7 Scale Water Tunnel Verification & Validation Test of an Axial Flow Water Turbine. Technical Report 13-002. Penn State - Applied Research Lab.